OUTPOST proudly presents A Magnitude in Albion – a collection of new and existing works by artist Andrew Lacon. Out in nature, on the scarred surface of common land, or inside the specially-treated rural sanctuaries of the inner-city, Andrew Lacon questions the experience of the contemporary English landscape and how we deal with boundaries and ownership of space. Defaced, obstructed, fallen, and penetrated hand-printed topographical photographs of England hang from the gallery walls and lay wounded on the concrete floor. To a conventionally trained photographer, these subtly composed and finely crafted prints might be considered flawed. However, it is through sculptural acts in the landscape and the gallery itself that Lacon interrogates the nature and value of the photograph as object, and of the landscape they depict. The familiar imagery of rugged fields under pallid skies on the peripheries of English towns and cities are present within Lacon’s large format photographic prints. But where cattle, people, and hedges in the field of a traditional landscape painting or topographical study would have depicted ownership of the land and distinguished territories of space, Lacon physically intrudes. A solitary grey fence post on common land becomes an emblematic minimalist sculptural structure piercing through a photographic image depicting the same landscape. Such an act has its analogy with the placing of an American flag on the moon – declaring a space one’s own, or speculating upon its future. Yet, as the name ‘common land’ describes not the land but the rights within it, the title Declaration suggests that the future of this space is beyond Lacon’s control. Images of space exposed onto gold plated bronze are crafted in shapes akin to the tips of fence posts encountered on the parameters of the Royal gardens of London. Reminiscent of the daguerreotype, that characteristically depicted portraits of the families who owned and treasured them, Lacon’s plates depict common land that belongs to no one. Though perhaps not as visceral as other works in the show, the gesture is grand and violent in its allusion to a question of exclusivity and value in experiencing both art and the landscape within the present social environment. Setting the parameters of the visible, one-hundred hand-printed c-type prints have a section cut out; a finely printed image of a lifeless tree surrounded by the bucolic greenery of a Royal park has fallen from its frame; a screen print on an image of an estate has its residential area swathed in a Constructivist inspired grey; and a once imperially occupied bowling green is set in a ninety degree frame with a topographical mapping of the perimeter. What connects these individual works is Lacon’s re-examination of the magnitude in perceived importance and beauty between the dichotomies of exclusive and inclusive spaces and the fine art and everyday image. 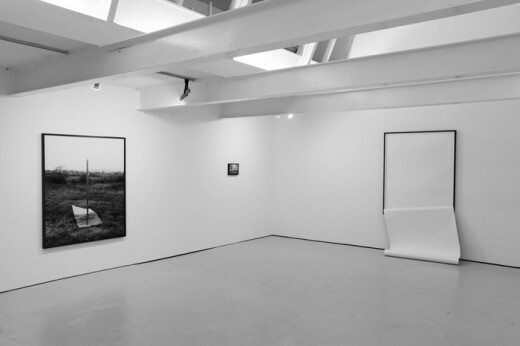 A Magnitude in Albion poses the question – what is contemporary English landscape? A question that carries the weight of English tradition and has troubled many writers, artists and townsfolk of all social classes who have sought understanding of the English landscape – asking themselves, what is town if it is not country? What is England if it is not the street where I live? Where others simply follow or sidestep this tradition, Lacon confronts.